3/31/2015 - Shrub Madness has come to a dramatic end this year with Fire Light® hydrangea being crowned the 2015 National Champion. Coming from a tough field of 64 contenders, the competition gradually narrowed to just two after multiple rounds of voting. 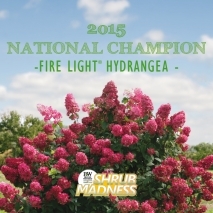 At the end of the final round, it was neck and neck but ultimately Fire Light® hydrangea took the lead and solidly defeated 2014 Shrub Madness National Champion Let’s Dance® Diva! hydrangea shattering hopes of back-to-back victories. Throughout the competition, over 83,000 votes were cast with everyone vying for their favorite shrub! This year’s Floral Four included Pinky Winky® hydrangea, Sweet Summer Love Clematis, Fire Light® hydrangea, and the 2014 National Champion, Let’s Dance® Diva! hydrangea. Shrub Madness unveiled an all-new user-friendly website this year, allowing consumers to fill out their bracket predictions online and the ability to vote online. It was a huge success! We received an outpouring of comments on Facebook. Be sure to join us next year for Shrub Madness and please join the Shrubs Center cast throughout the year for continuous coverage.